It’s no secret I love to laugh. I think it’s the key to staying young. Some would say I have a distinct laugh and I embrace that. Now, in my clown clan, we are infamous for joking around and laughing. It also happens when we recap the previous night’s embarrassing interactions with other people. We really should be kept caged, separate from the world. Here’s the thing–I am notorious for taking embarrassing stories of someone and running with it. I like to torture them for a good laugh. I mean it sounds mean, but it’s all in good fun (for me). GOL! A few months ago, I was at the Christmas Tree Shoppe. That store is so underrated; I love it! You can find all the junk that you have ever dreamed about and I am the sucker who needs everything they have. As I was weaving aisle through aisle, I came across the most fantastic thing ever; it is probably my greatest investment. The store had packs of napkins that had $100 imprinted on them. Jackpot! I’m the ultimate consumer; I have to spend money every single day no matter what, regardless if I need something or not. Don’t get me wrong, it’s not like I have an abundance of cash flowing through my pockets. Believe it or not, I have a shopping addiction. My friends think that I spend too much on clothes. What they don’t know is that when I tell them that I haven’t gone shopping (for clothes) in a while, I veer onto something else to buy, like unnecessary home goods and/or paint and canvasses, even though I have many blank ones. I always have a reason to buy a different kind. I avoid stores like Christmas Tree Shoppe,Marshalls, or Target because I am overwhelmed with all the things I can possibly buy. Actually, yesterday was the first day that I didn’t spend money, not even on lunch, only because I came home from work and went directly to sleep. However, I do love buying things for others. You make think it’s selfless but I actually get a personal satisfaction giving gifts. When a gift is well-received, I find relief because I know that it was a purchase worthwhile and confirms that I don’t have an addiction. I really live a hard life. GOL! Back to these bills. I was overjoyed by my purchase, so much so, that I carry them in my purse. My sister and I went out for sushi and it was time to pay. These napkins look so realistic from a distance, that I had to take it to my advantage. I thought it would be a great joke to leave a napkin on the table. From afar, it would look like I left him a $100 tip, but actually left him the usual, measly 20%. I am horrible at practical jokes. That’s why I think I would never make a good actress (because I always end up blowing my cover). I started laughing as soon as I thought of this brilliant idea. I couldn’t even contain myself. By the time I got the napkin out, I needed to use it to wipe away my tears formed by my hysteria. 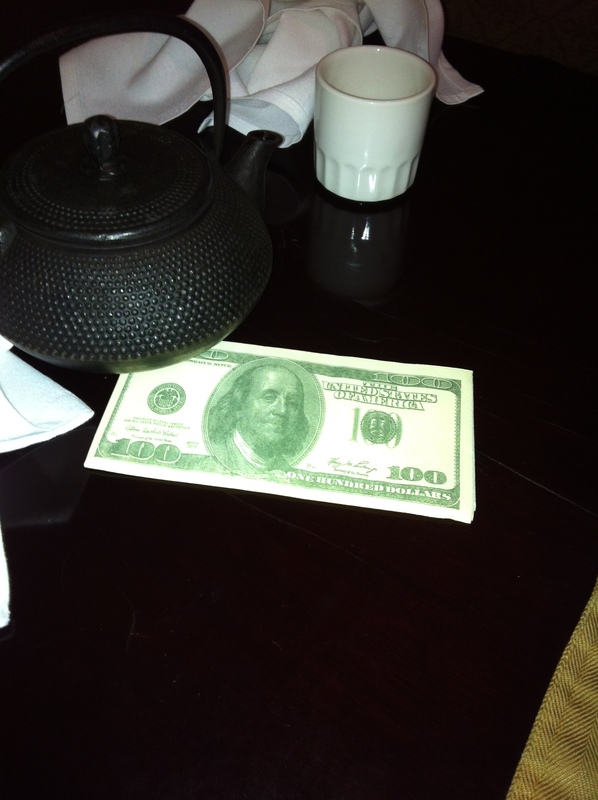 After I obtained my composure,I strategically placed it with the dining bill, outside of the envelope. I had to get out of the restaurant immediately because I felt my giggles trying to convulse out of me. Unfortunately, I wasn’t able to catch their reaction;however, I was a regular at this sushi bar. As it turns out, they took my joke in good humor because they were quite chummy with me the next time I was there. From the looks of it, I get a real kick out of Benjie Franklin, a man who has died but still gets me with his charming looks. GOL! On aside:: You probably thought that I was going to post “Bills, bills, bills” by Destiny’s Child. Even though that is an amazing song, I have posted a different one. I must say, I love my iPhone, it helps me when I need it the most. For example, when I am listening to the radio and jamming out but have no idea what song I am listening to. I can rely on my handheld cancer device to save me! I don’t know what it is about this song, but I think the beat is so hot! Take a listen. Next Post Guest Blogger: Is She Dead Yet?